1. From Mumbai travel to Navi Mumbai (Vashi, Palm Beach Road, Belapur, Kharghar, Kalamboli) and get onto the Mumbai Pune Expressway (NH4, Yashwantrao Chawan Express way). 2. Exit the Mumbai-Poona Expressway at the Khalapur Toll Plaza (Khopoli Toll Naka). The Khalapur Toll Naka is on the left. Distance from start of the Mumbai Pune Express way, at Kalamboli (McDonald’s), to Khalapur/Khapoli exit, is 33.5 Km. 3. 0.5 Km from the Expressway Khopoli Exit, the road splits into two. The North Road (left) goes to Khopoli and Khalapur towns. Take the South Road (Sharp right). This is the Khopoli – Pali Road (State Highway 92). 4. To reach Adlabs Imagic travel straight south for 3.7 Km on the “Khopoli Pali” Road. 1. From Pune reach the Mumbai – Pune Expressway. Cross Urse/Talegaon Toll Naka on the Expressway. 2. Next destination is Khopoli in the North. This can be reached in two ways. 3. First Khopoli road route is to take the Lonavala Exit and travel to Khapoli on the old Mumbai – Pune Highway (NH47). 4. Second (and better) Khopoli route is to Cross the Lonavala and Khandala Ghat Section on the Mumbai-Pune Expressway and at the end of the ghat, as the road is reaching flat land, there is an exit to Khapoli on the left. 5. Keep travelling West and cross Khopoli. Travel west until you reach Khapoli – Pali Road (State Highway 92). Hotel Shree Krishna is the landmark. 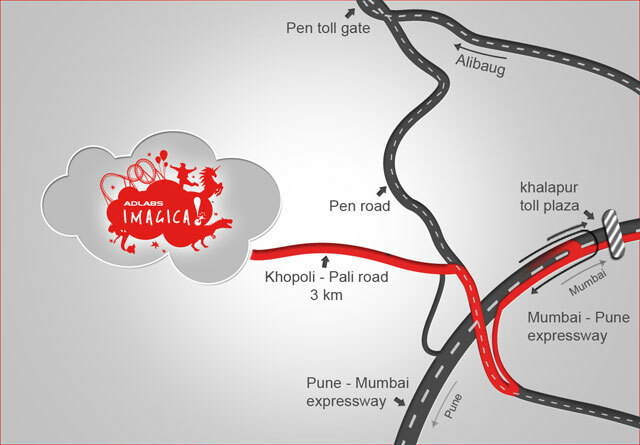 Turn straight South on the Pali – Khopoli Road and Imagica is 4.0 Km away.